Ecuador, 1865, 1r Yellow, three blocks in shades; includes right sheet margin block of 8 (positions 26-27 / 35-36 / 44-45 / 53-54) in yellow buff, block of 4 (positions 16-17 / 25-26) in dark chrome yellow and block of 4 (positions 13-14 / 22-23) in chrome yellow, full o.g., all with full margins, block of 8 with tiny internal hole in margin, still Very Fine. Ecuador, 1865, 1r Yellow, block of 4 (positions 76-77 / 85-86), o.g., lightly hinged at top, clear to large margins, Very Fine and choice. 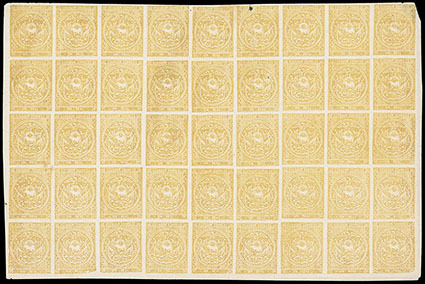 Ecuador, 1865, 1r Deep Yellow Chrome, lower half sheet of 45 (positions 46-90), prominent constant plate flaws include position 66 (colorless line at bottom right), position 71 (colorless line through "REAL") and positions 83 & 90 (damaged lower right corner), full o.g., full margins to just touching at top right, small ink mark affecting position 51 at top and tear at bottom affecting position 83, otherwise Very Fine, the largest recorded multiple of the 1r in the yellow chrome shade. Scott No. 4 Estimate $1,500 - 2,000. 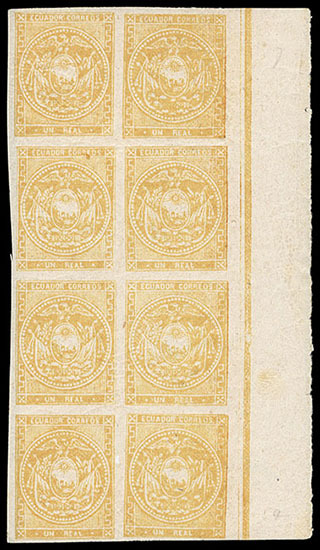 Ecuador, 1865, 1r Yellow Ochre, top half sheet of 45 (position 1-45), full o.g., clear margin at bottom and full sheet margins around, flaws including vertical crease in 4th row, few sealed tears and margin nicks, F.-V.F., a scarce multiple, ex-Lund. Ecuador, 1865, 1r Yellow, Diagonal Bisect, three on piece; includes dark orange shade tied by "Chimbo, Franca" circular handstamp, another tied by 1867 Montecristi cds and a chrome lemon yellow shade tied by "Quito, Franca" circular handstamps; few flaws, F.-V.F. Scott No. 4c Estimate $100 - 150. Ecuador, 1865, 1r Chrome Yellow, horizontal strip of 5 on piece (positions 40-44), red fancy "P.I." cancels of Quito, full margins, pre-use tear affecting first stamp, Very Fine appearance, ex-Olgieser. The P.I. stands for "Porte Interno" or internal fee. 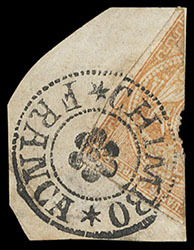 It is believed that this cancellation was produced in France and was introduced in 1870. 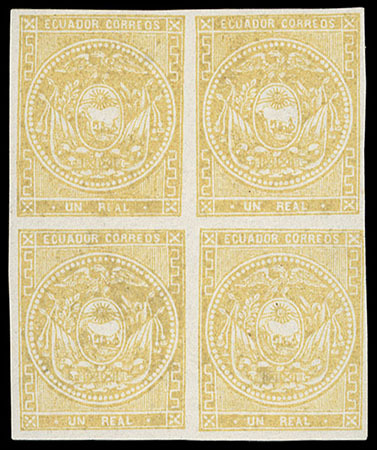 Ecuador, 1865, 1r Yellow Buff, Irregular Block of Eleven, positions 73-78 / 83-87, full margins, canceled by "Guano, 23 Nov." cds's on Judicial wrapper to Riobamba, manuscript "21½ oz" weight notation at upper right; horizontal file fold affecting top stamps in block, otherwise Very Fine, a very rare high value franking from Guano, with just about tens covers are known originating from this town, ex-Olgieser. Scott No. 4 Estimate $2,000 - 3,000. 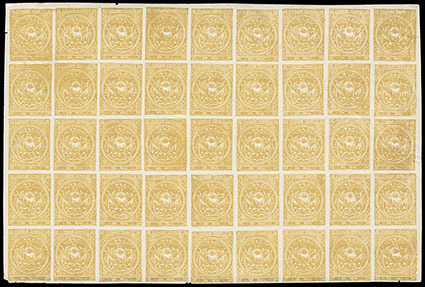 Ecuador, 1865, 1r Yellow Buff, Vertical Strip of Four and Single, full margins, canceled by manuscript "Cariamanga #" on Judicial wrapper front with backflap to Zororanga, with "9½ oz" weight endorsement at top and 1872 year docketing on backflap; slight soiling and horizontal crease on third stamp in strip, F.-V.F., a rare usage from the tiny town of Cariamanga. Despite being a late use, a second period printing was used, probably due to the fact that few mail was dispatched from Carimanga and remainders from an earlier printing were then available at that office. Ecuador, 1865, 1r Yellow Buff, Vertical Strip of Four and Pair, both with full margins, tied by indistinct Riobamba cds's on Judicial front to Guaranda, manuscript "12 oz" weight notation at top center, Very Fine. Ecuador, 1865, 1r Yellow Buff, Four Singles, tied together by "Riobamba, 9 Fevr" cds's on Judicial front to Guaranda, manuscript "7½ oz." weight notation at top, Very Fine.